I would love to work with you and help you achieve your goals. Your nutrition plan will be made specifically for you (no cookie-cutter plans) and tailored to your specific goal whether that be restoring health and balance through Nutritional Therapy or by working with me to lose weight, leaning-out, gain muscle, Reverse Diet, or optimize performance through one of my macro-based plans. Each and every client is different and has their own individual needs and lifestyle. If you are confused as to which program will suit you best, please contact me via e-mail or the form below. If you still need clarification I am happy to offer you a free 15-minute consult. PLEASE NOTE THAT ALL PURCHASED PROGRAMS MUST BE COMPLETE WITHIN 6 MONTHS OF PURCHASE. As a Nutritional Therapy Practitioner (NTP) I believe it is crucial to teach the importance of properly prepared, nutrient-dense, whole foods diets as a means to help your body function as it was designed to. Through working together we can help bring your body in to balance. As someone who has learned to thrive with three autoimmune diseases and has recovered from extreme Adrenal Fatigue, I know what you are going through. There is no one perfect diet that works for everyone because we are all individuals with different histories and genetics. While some people thrive on a diet relatively low in fats and high in carbohydrates, others function best on a high fat and low carb diet. I was taught to focus on the concept of bio-individuality. As an NTP I am trained to help each client find the right types of whole foods that will restore balance and enhance their ability to heal. Although wellness-minded doctors appreciate the importance of proper diet and nutritional supplementation, it is often very difficult for them to do the proper evaluation and dietary counseling necessary to support optimal healing. NTPs are trained to work alongside these practitioners to support the doctors’ diagnosis and other therapies. Initial Session**: $150.00 Preliminary questionnaires (extensive), background research (generally takes me 60-90 minutes), and in person or Skype appointment. The appointment is 60-90 minutes in length and can be done in person or via video conference. Functional Evaluation Exam: $125.00 In-person exam. Must complete the Initial Session prior to the Functional Evaluation Exam. Exams generally run 90-120 minutes in length and are done in person. While the in-person exam is extremely valuable, if you live out of town, there is still plenty we can do without the exam. Follow-Up Sessions: $75.00 Sessions are up to 60 minutes in length (sometimes they’re fast and sometimes long) and can be done in person or via video conference. Customized Supplement Service**: $50.00 Supplement recommendations tailored to you specifically. I will send you an extremely in-depth questionnaire which I will use to create supplement recommendations for you. 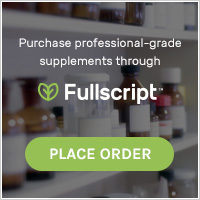 I will send your specific supplement recommendations to you via Fullscript where you can order them directly. Multi-Session Packages can be purchased at a discount. Contact me to discuss. **Clients who sign-up for an Initial Session receive the Customized Supplement Service as part of their program. If you are not familiar with what a Reverse Diet is, click HERE for more information. Motivated individuals please contact me through the form below. I take my coaching seriously and want my clients to do the same. If a client signs-up for a program with weekly check-ins, it is THEIR responsibility to check-in with me on a weekly basis. It is my right to refuse to work with a client if after receiving their Introductory Questionnaire I do not feel we are a good fit. In this situation I will refund the client their purchase price minus a $25 service fee. PLEASE NOTE THAT THERE ARE NO REFUNDS ON PURCHASED PROGRAMS & INTRODUCTORY QUESTIONNAIRES MUST BE TURNED IN WITHIN 1 MONTH OF PURCHASE. PLEASE ALSO NOTE THAT IF YOU PURCHASE A PROGRAM THAT INCLUDES WEEKLY CHECK-INS AND ELECT NOT TO CHECK-IN IT WILL NOT CARRY OVER (unless prior arrangement was made with FitQuest). FitQuest reserves the right to refuse service to anyone. If you have questions about which program program is best for you, please click HERE for more detailed program descriptions. If you still have questions after reading this document, please contact me via the form below. If you are ready to purchase a program, CLICK HERE to purchase through PayPal. Once you have purchased a program I will e-mail you my Introductory Questionnaire. As part of the questionnaire, I require you to track your food intake for 7 days at the very minimum, however, the best results are obtained when you provide me with 14 days of food logs + your daily weight during that time period. Upon completion, you will send me the questionnaire via e-mail and I will confirm receipt at which point I will get to work creating your personalized plan.